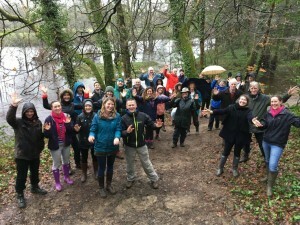 Community energy organisations from across Devon and further afield met on the Dartington estate in Devon for a two-day, fun filled residential on the 9th and 10th March 2018. This included walks, talks, films, fantastic food and collaborative discussion themed around community energy innovation. During the two days we concentrated on consolidation of our existing projects, discussing how to make the most of our renewable energy assets, and exploring what happens next for our movement. Thanks to Regen for organising and for the support from Devon County Council, Western Power Distribution and Power To Change.